Reed Jessen picks up trash on North Howard Street as a result of a Crowdswell project. It started with the observations he made on his daily commute. Graffiti on a stop sign. Trash in bushes. Bus stops without benches where elderly riders stood waiting. The naked wings of the iconic Expo '74 butterfly structure in Riverfront Park. Eric Dahl saw problems like this everywhere, and he always thought the same thing. I wish I could change that, but I don't have time, and don't know how to start. Now, about 18 months later, Dahl has launched a means to a solution for these lingering urges for positive change: Crowdswell. Crowdswell is based on the concept of crowdfunding, popularized by companies like Kickstarter and Indiegogo, but instead of raising money for an individual's or startup's project, the site serves as a hub to create awareness and support for issues that, when solved, benefit a community as a whole. Projects posted on the site are referred to as "swells." "A swell is an exponential effect, and [Crowdswell] is set up to create exponential funding," Dahl explains. It's less like a fundraising hub for nonprofits than it sounds. Dahl describes it as a "marketplace for good" that lets people who see problems — like those he sees on his way to work — define them and spread awareness to others who may have the means to help fund a solution and/or solve them. Swells are free to create, but Crowdswell takes a 5 percent cut from each contribution as its overhead, along with a small transaction fee. Dahl cofounded the venture with the three owners of Magner Sanborn; he was formerly the Spokane-based advertising firm's digital director. Crowdswell's beta version went live a few weeks ago, and already several projects have been completed. To launch the test version, Dahl and a group of promoters traveled last month to Austin's South by Southwest arts, music and tech festival, where Crowdswell was warmly received. Since then, Dahl says that one project has been completed in Austin so far, and several other endeavors there have been created. 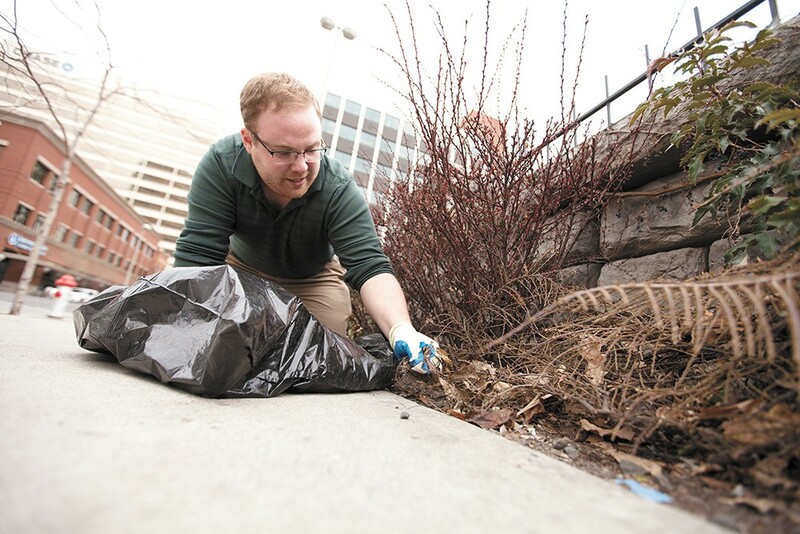 In Spokane just last week, Crowdswell user Reed Jessen, a local patent analyst, took charge to complete a swell seeking someone to clean up garbage littering bushes downtown, along Howard between Main and Riverside. The initiative brought in a total of $51 from donors giving anywhere from $2 to $10 each. To successfully complete the project — swells are open to be completed on a first-come, first-serve basis — Jessen had to follow instructions and fulfill requirements outlined by the swell's creator, documenting his efforts with photos posted back to the page. Only after Crowdswell users and administrators could confirm he completed the task as specified was the $51 released to him. While realistically it may not have cost Jessen that much to pick up the trash along the street, the idea of letting Crowdswell users give to initiatives with unspecified contribution goals is intended to incentivize other community members with the means to step up and agree to complete a project at whatever amount they feel comfortable. Larger projects with significant costs to actually implement can set targeted dollar amounts so the community knows how much a project realistically needs before it's viable. With those types of projects, Dahl explains that there are protections in place so a person without relevant experience can't take on the swell. In such instances, the swell's creator can request to be designated as the organization that also will complete the project. Examples of these larger initiatives currently posted on Crowdswell include efforts to fund the long-envisioned U-District pedestrian bridge over the railroad tracks, goaled at $200,000, and a plan by Pet Savers in Spokane Valley to acquire and equip a mobile pet spay-and-neuter unit. That effort is goaled at $8,000 and has so far gained $41 in contributions. Although Crowdswell has yet to officially launch nationwide, there have been projects launched in Pullman, Seattle, Grand Rapids, Mich., Southern California, and even as far away as Australia. Dahl can't predict how far Crowdswell may go, nor the efforts it could play a role in accomplishing. For him, it's more about empowering people to do more in their communities, whether they use Crowdswell or not.